Year 2, Week 7: A Scarecrow Lunch. Halloween is a fun time of year around my house. We plan costumes early and usually dress as a family for fun. Last year we were Captain Hook, Peter Pan, Tinker Bell, and Wendy. This year we are going to be...well I wont ruin the surprise. We also go to a huge Pumpkin Patch Party at our church, but my favorite thing is taking my kids trick-or-treating. Needless to say I plan to have a lot of fun with lunches for my daughter this season. If you want to see some of the fun from last year, look at the lunches from last October. 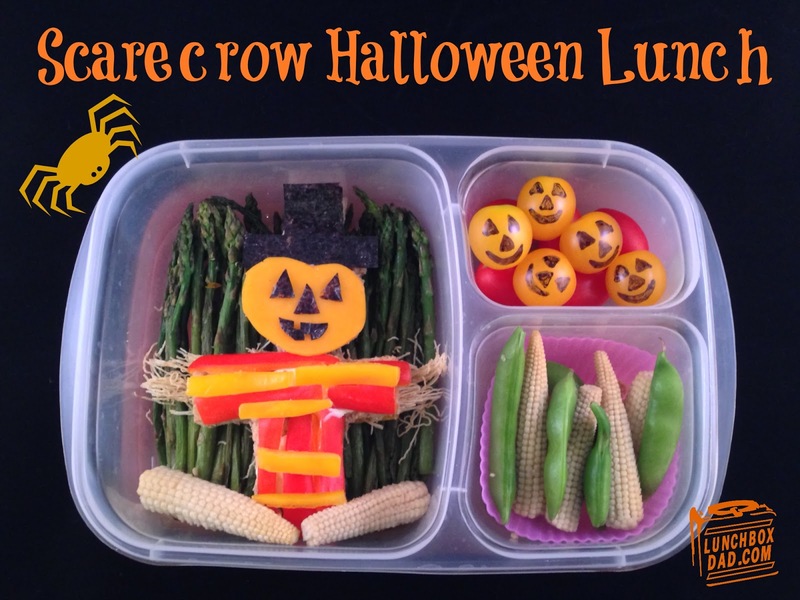 So have some fun making some great Halloween lunches for your kids this year. 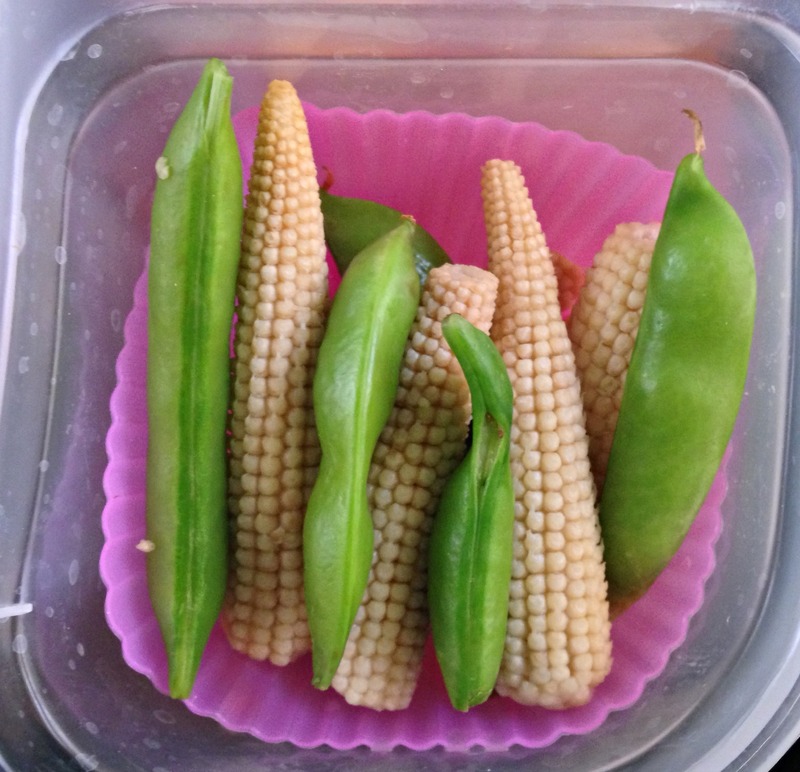 I made this lunch in an Easy Lunch Boxes container and also put in a Lunchbox Love note. These lunches don't have to be complicated, just put a little love in them! 1. Arrange asparagus spears "corn stalks" in main container. I sauteed and cooled them before I put them in the lunchbox. 2. Slice bread, cheese, and meat into the shirt shape. Put sweet peppers on top of bread in a striped pattern. You can "glue" them on with a little string cheese. Place meat and cheese below the bread. Slide a little bit of shredded wheat into the end of each sleeve. 3. Cut a circle of cheese for the head and place on top of a circle of bread. Cut out nori face pieces and place them on cheese. You can also cut a hat out of bread and put nori on top to make it black. 4. Place all of the pieces on top of the asparagus. 5. 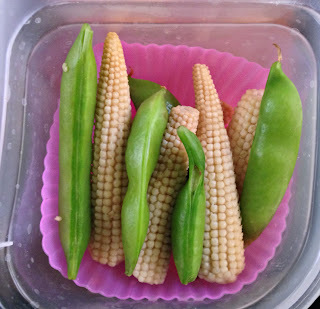 In one side container arrange the baby corn and sugar snap peas. These are great by themselves or dipped in a little ranch or humus. 6. In the second side container drop in some grape tomatoes. I used red and yellow. 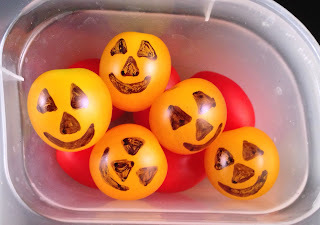 For the yellow ones, I drew on them with black food coloring so they would look like jack-o-lanterns. 7. 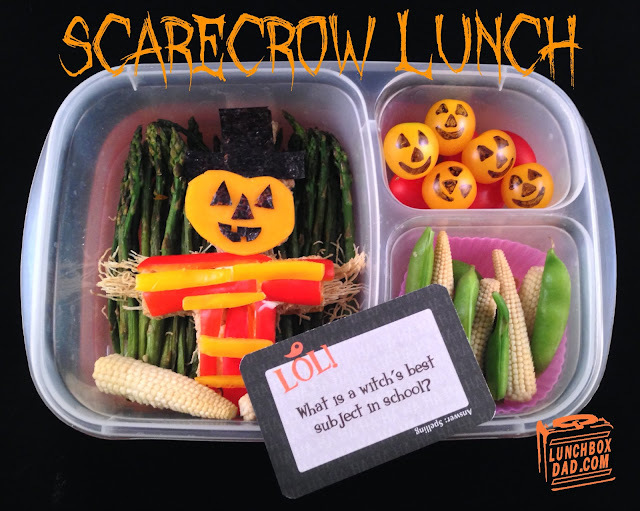 For the finishing touch, use Halloween themed Lunchbox Love notes. I show the one I used below. Thanks for reading my blog and make sure to follow me on Facebook, Twitter, and Pinterest! Have a great month making lunches for your kids and also check out my expanding section containing reviews on other products for parents. Thanks, my daughter loved it!